If you plan to enjoy any of the activities suggested in last week’s blog, you’re sure to work up an appetite–but don’t worry, because we’ve got you covered! Scranton is home to some delicious and unique dining locations, from diners to ice cream parlors to international cuisine. Dig in! Located in Clarks Summit, PA, this family-owned and family-friendly cafe is just a short drive from campus. Baked goods, such as homemade pies, nut rolls, and cookies, are made daily, and you can’t go wrong with any of the generously portioned breakfast or lunch options! This old-fashioned eatery and coffee shop on Prescott Ave offers baked goods and breakfast items, as well as various sandwiches, salads, and burgers. Highly recommended by one of our tour guides, Mansour’s brunch menu is a must try while you’re in town! Italian for “soup of the day,” Zuppa Del Giorno is located right in Scranton and is renowned for its savory soups and sandwiches. Warm up on a rainy day with a wild mushroom or red pasta fagioli soup, or take a quart home to enjoy! A unique and newly opened restaurant just a few blocks from campus, the Peculiar Slurp Shop offers a twist on the classic ramen noodle. Chow down on shrimp yakisoba, slurp up a seaweed salad, or dine on chicken miso ramen, while sipping on organic green tropical iced tea. Yum! This family-owned restaurant located in West Scranton offers authentic Lebanese cuisine. Start off with homemade hummus and pita or a tabouli salad, then dig into savory dishes such as the chicken shawarma, grape leaves, and vegetarian or meat pies. For dessert, enjoy freshly baked baklava or moughly! With both indoor and outdoor patio seating, this family-friendly restaurant offers classic American pub fare. The menu includes various meats, such as beef (Au Poivre Burger), chicken (Just-A-Fried Chicken Sandwich), and pork (the Banjo Pig), as well as delicious vegetarian options (open-faced Portobello Sandwich). Be sure to try the loaded fries, topped with the special Backyard Chili! This classic Italian restaurant makes all of its pasta and bread fresh daily, and the homemade pasta is so popular that seconds are free! Enjoy a slice of brick- oven pizza, savor a plate of warm linguine pescatori, or try a personal favorite, the rollitini forno! Located one block from campus, Eden features an all-vegan menu to be enjoyed either inside the cozy dining area or at one of the outdoor sidewalk tables. Vegan sandwiches, wraps, pizzas, and burgers that are bursting with flavor and originality are right around the corner! With over 50 unique flavors to choose from, Manning’s homemade ice cream is a staple in Scranton. Check out the various locations close to campus, or take a short drive to the Manning’s Farm and Dairy in Dalton, PA! This yummy ice cream parlor located in Moosic, PA serves both hard and soft ice cream, as well as a wide selection of edible cookie dough flavors. Treat yourself to a sweet treat, topped with a dollop of cookie dough! Located in Dickson City, this vegan frozen yogurt parlor offers fun flavors and creative rolled froyo. Grab a bowl and help yourself, or try one of the handmade unicorn rolls! 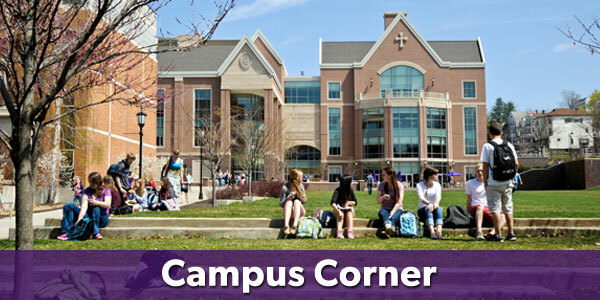 Now that that your stomach is growling and your mouth watering, click the link below to schedule your visit to The University of Scranton and explore the great eateries of our city! Come hungry! *Stop by our Admissions Office for a campus visit and/or information session, and receive a 10% off coupon to this restaurant! This entry was tagged #OurScranton, restaurants, scranton, scranton food. Bookmark the permalink.